Life is busy, and we all need that go-to recipe for nights when time is not on our side. I'm talking the kind of recipe where you literally pop open a few cans, mix some things together, and put it in the oven. 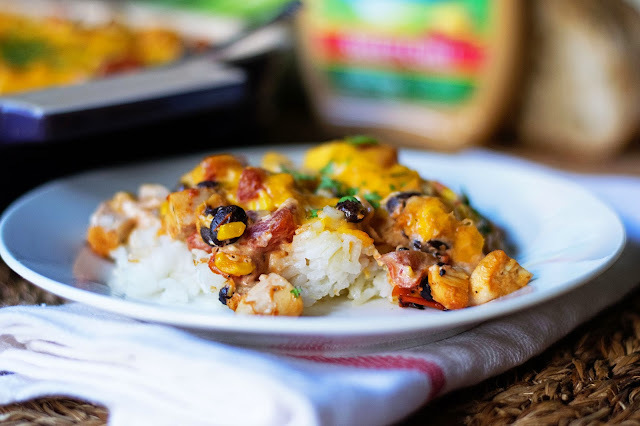 The good news is that with a few simple ingredients and some of Hidden Valley Ranch's Sweet Chili Dressing that "throw-it-together" meal can be transformed into something that your family will ask for time and time again. 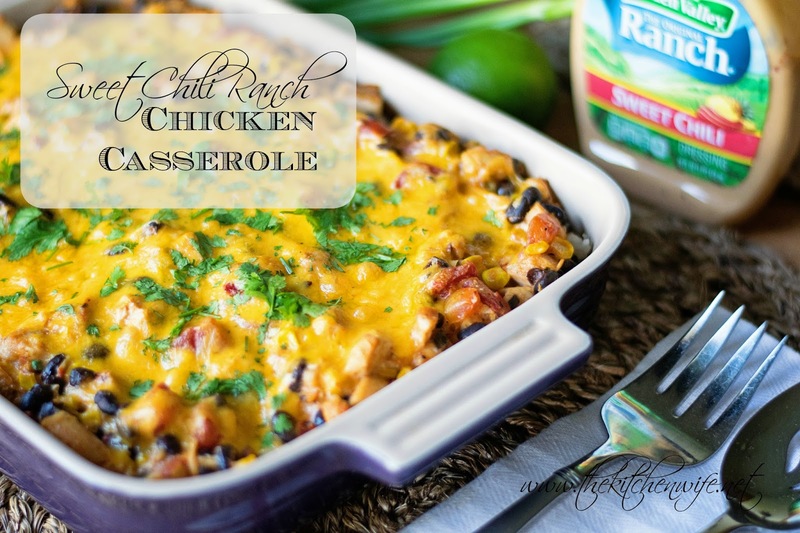 Take my Sweet Chili Ranch Chicken Casserole for example. It literally takes minutes to put together, uses all pre-cooked or canned goods, and is finished in 30 min! The secret is in the ranch. 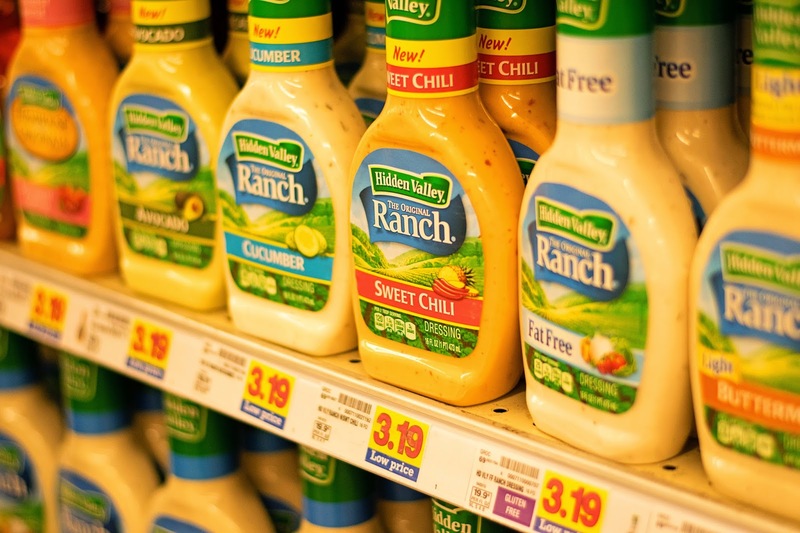 I found my Hidden Valley Ranch Sweet Chili Dressing in the salad dressing aisle of my local Kroger. It was clearly displayed toward the top of the shelf, and I had no problems finding it. Next place a large pot over medium high heat and add 2-3 tbsp. of oil. Cook until you smell the garlic coming from the pan. My family likes a little spice so I used the southwest style corn with red peppers and poblanos, but if spice is not really your thing feel free to use plain canned corn here. I promise it will be equally delicious. add them to the pot as well. Next drain the fire roasted tomatoes. Zest the lime and add the zest to the pot. Squeeze in the juice of one lime. Casseroles tend to be rich and heavy, but the lime juice brightens everything up and adds a nice sweet flavor. Now, for a little decadence. Add 4 oz. of room temperature cream cheese. Give everything a stir and let the cream cheese melt into the pot, coating everything. I used cooked chicken from my freezer, but you can use left over chicken, rotisserie chicken, or dare I say canned chicken! Add the Hidden Valley Ranch Sweet Chili Dressing and stir everything together until it is all coated in the sauce. Once again give everything a stir, then taste for seasoning. Make any adjustment you feel it may need. Next place the cooked rice in the bottom of a 9x13, greased, baking dish. Here is how I made the rice. Bring 2 c. water to a boil. Add 1 c. rice. Lower heat to a simmer. Cover, and let cook for 20 minutes. Now you can pour the casserole mixture over the rice. Top it with 2 c. of shredded cheddar cheese. Place in a preheated oven for 30 minutes. And there you have it! A beautiful family meal that required minimal prep work. You literately just threw everything together. And the flavor, oh man, it is out of this world! I like to add chopped cilantro for a little extra freshness. This meal is even elegant enough to serve to friends. Who knew a few canned goods from your pantry and a bottle of Hidden Valley Ranch Sweet Chili Dressing could be transformed into this! Now that I've shared my quick and easy recipe with you. I'd love to hear about yours! 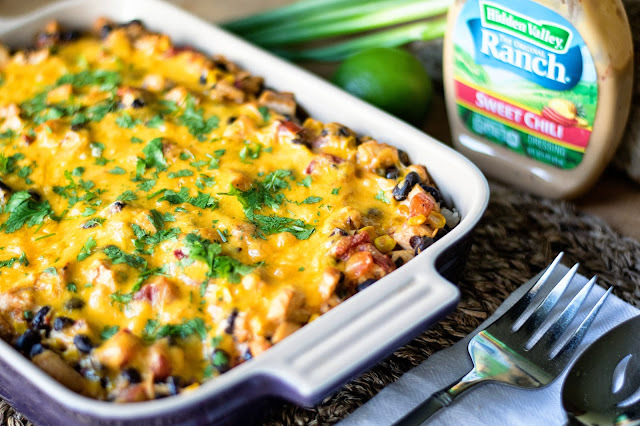 Leave a comment sharing your favorite recipe using Hidden Valley. And if you are looking for some inspiration check out http://cbi.as/9p7y for more recipe ideas. Place a large pot over medium/high heat and add 2-3 tbsp. of oil. Add the scallions and garlic. Cook until you smell the garlic coming from the pot. Add the corn, black beans, and fire roasted tomatoes to the pot. Add the cream cheese. Let the cheese melt and stir until everything is coated. Add the chicken and Hidden Valley Ranch Sweet Chili Dressing. Mix everything together until it is all well coated. Add the salt and pepper. Stir and taste for seasoning. Make any adjustments you feel it needs. Place the cooked rice into the bottom of a 9x13, greased baking dish. Pour the chicken mixture over the rice. Top with shredded cheddar cheese and place in the preheated oven for 30 minutes. Remove from oven, top with fresh cilantro, serve, and ENJOY! I made this last night and was great! I will definitely make it again. I just wanted to point out, though, that the printable recipe doesn't tell you what to do with the lime. I found it from your step by step instructions on the website, and it didn't really matter anyway. It's yummy no matter when you add the lime, but wanted you to know. Thanks! I'm so glad you enjoyed this, and I can't believe I missed that! Sometimes you read these over and over so much that you begin to see what you want. *lol* I will fix it right away. Thank you so much for letting me know! This looks so good!! Need to try this!